May 2, 2011 - Wayne P. Groen, 42, of Lynden, Washington, was convicted on Friday of incapacitation of an individual during authorized operation of an aircraft, following a two day jury trial in U.S. District Court in Seattle. The jury deliberated about one day before finding Groen guilty on one count, and not guilty on a second charge of interference with the authorized operation of an aircraft. Groen was indicted in January 2011, for the events of September 22, 2010, when Groen shined a high powered spotlight on a border patrol helicopter that was being flown by a pilot wearing night vision goggles. The spotlight blinded the pilot making it impossible for him to see the airspace around him, and the dials necessary for flying the aircraft. The co-pilot had to direct the pilot to fly out of the area. Groen is scheduled for sentencing by U.S. District Judge Thomas S. Zilly on August 4, 2011. According to records filed in the case and testimony at trial, at about 9:35 in the evening on September 22, 2010, the helicopter was supporting law enforcement on the ground working to intercept those illegally crossing into the U.S. from Canada. The helicopter was about 600 feet off the ground, near the Abbotsford B.C. airport, when the defendant targeted a high powered spotlight, endangering the aircraft, pilots and people on the ground. 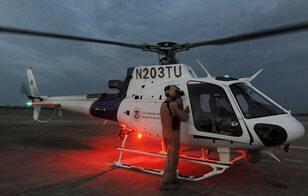 The beam was trained on the helicopter for three to five minutes. The helicopter returned shortly thereafter to assist in discovering the source of the spotlight. The pilots and investigators on the ground observed that the spotlight was coming from the vicinity of Groen's home. When an agent on the ground drove up Groen's street, Groen shined a high powered spotlight at him. Groen got out of the car with the high powered spotlight in his hand. Groen was arrested December 17, 2010, on a criminal complaint. The case was investigated by the Department of Homeland Security and the FBI. The case is being prosecuted by Assistant United States Attorneys Jerrod Patterson and Jill Otake.